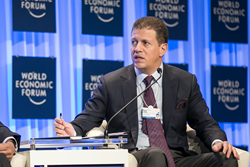 Majid Jafar, CEO of Crescent Petroleum, calls for leaders at this year’s Annual Meeting of the World Economic Forum in Davos to put economic stability in the Middle East on top of the agenda. We must create long-term sustainable economic growth. Employing our youth is the key to unlocking our true natural resource. Speaking on the “Arab World Context” session on the first morning of the Summit, Majid Jafar says: “The Arab Spring has now clearly turned into a winter of discontent. In parallel with all the political efforts, we need quick and urgent economic action to address the issue of high youth unemployment in the Middle East and North Africa (MENA) Region. Insufficient economic growth in the region has led to massive youth unemployment, in some areas more than 60%. This is turning into a demographic time-bomb. “The recent fall in the oil price is also a warning that the region cannot be over-reliant on energy resources for GDP growth. We must create long-term sustainable economic growth. Employing our youth is the key to unlocking our true natural resource. We cannot achieve political stability without economic stability,” he adds. Jafar’s comments are backed up by the annual World Economic Forum Outlook on the Global Agenda 2015 Report, which cites persistent youth unemployment as the number one challenge for the region in the year to come, ahead of managing political transitions and societal tensions. High levels of youth unemployment and a mismatch between education and the skills required by employers have led to a vicious circle, where economies stagnate and there is an over-reliance on extracted commodities. One scheme that Jafar suggests could tackle the over-dependence on oil and the high youth unemployment in the region is the Arab Stabilization Plan (ASP). The ASP is a policy initiative for a regional framework to promote infrastructure investment and create jobs. The proposal, which takes its inspiration from the US-led Marshall Plan to re-build post-war Europe, would prioritise infrastructure projects on a national level and boost economic growth in countries such as Egypt, Jordan, Yemen, and Tunisia. Investment would come mainly from within the Arab world such as the Gulf countries, and the private sector. “The MENA Region is currently going through changes that are unprecedented in the last century. In many cases the region has failed to build national identities let alone a regional one, failed to build inclusive and stable institutions, and above all failed to build private-sector driven competitive economies. There is capital, but the region needs a focused multinational effort to create regional trust and direct it into long-term infrastructure investments. This will create employment and sustain economic competitiveness,” Majid Jafar concludes.